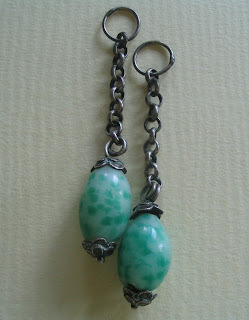 The pair of pretty antique earrings shown below is made from Peking glass beads. I can't decide whether these beads have been recycled into earrings or whether they are just broken earrings. Looking at the end holes beneath the silver caps, I can see damage, so the beads may have been retrieved from a bead necklace and remade/recycled into earrings. Or they may have been earrings all along and the ends merely damaged from use. Who can tell? The silver chains look like from late Qing period and the earrings probably date from late 19th century.